A pillow filled with a mixture of Christmas chocolates and a mini Candy Cane. 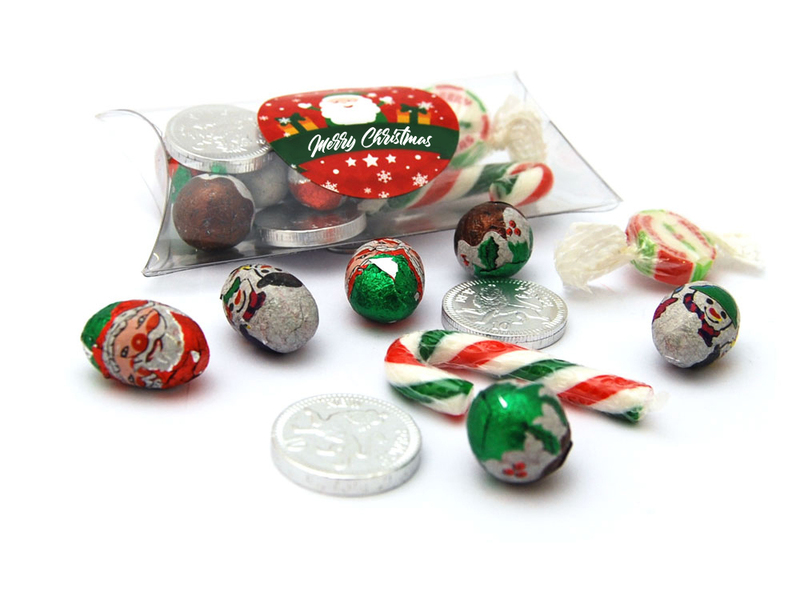 These small pillows of Christmas themed chocolates make great stocking fillers or party treats. 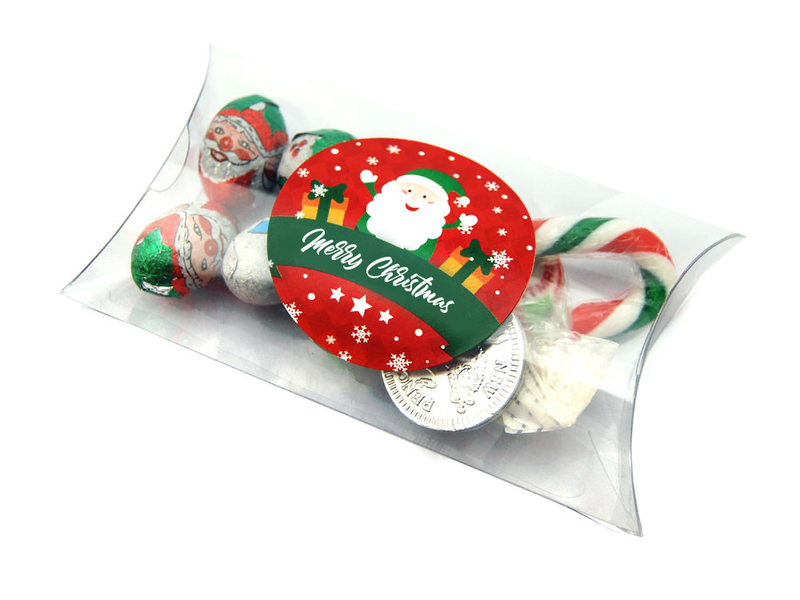 Milk Chocolate Santa Egg: Milk Chocolate (100%), Sugar, Cocoa Butter, Skimmed Milk Powder, Cocoa Mass, Whey Powder (Milk), Lactose (Milk), Milk Fat, Emulsifier (Soya Lecithin), Natural Flavouring, Cocoa Solids (25%) Milk Solids (14%). Allergen Advice: Highlighted Bold in Ingredients list. Made In A Factory That Handles Nuts. Product Includes Soya and Milk Derivatives. Not suitable for nut and peanut allergy sufferers due to manufacturing methods. 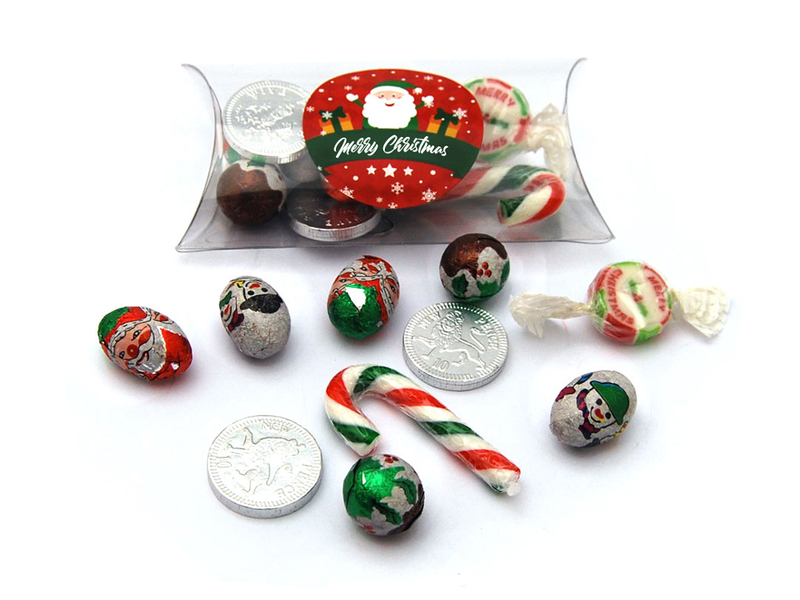 Milk Chocolate Snowman Egg: Milk Chocolate 100% (Sugar, Cocoa Butter, Full Cream Milk Powder, Cocoa Mass, Whey Powder, Emulsifier (Soya Lecithin), Natural Flavour). Cocoa Solids (25%) Milk Solids (14%). Allergen Advice: Highlighted Bold in Ingredients list. Product Inclues Soya and Milk Derivatives. Made in a factory that handles NUTS. Not suitable for nut and peanut sufferers due to manufacturing methods. Mini Candy Cane: Sugar, Glucose Syrup, Maltodextrin, Flavouring, Colours (E120, E141i, E171). Allergen Advice: Highlighted Bold in Ingredients list. Milk Chocolate 10p Coin: Sugar, Whole Milk Powder, Cocoa Butter, Cocoa Mass, Whey Powder, Emulsifier: Soya Lecithin, Natural Vanilla, Cocoa Solids (28%), Milk Solids (16%). Allergen Advice: Highlighted Bold in Ingredients list. May Contain Traces of Milk, Soya and Wheat. Rock: Sugar, Glucose Syrup, Flavouring, Colours (E171, E153, E102, E110, E122, E129, E133, E132, E155). Allergen Advice: Highlighted Bold in Ingredients list. May contain traces of Milk. Colours may cause an adverse effect on children.